Many people use buses as mass transport. A 2012 study in Journal of Safety Research notes that buses are not, by some measures, safer than cars. A 2012 National Transportation Safety Board (NTSB) information brief notes that nationwide, more than 700 million passengers — nearly the entire population of Europe — are transported by buses annually. Since so many people take the bus, a bus accident can have serious consequences. 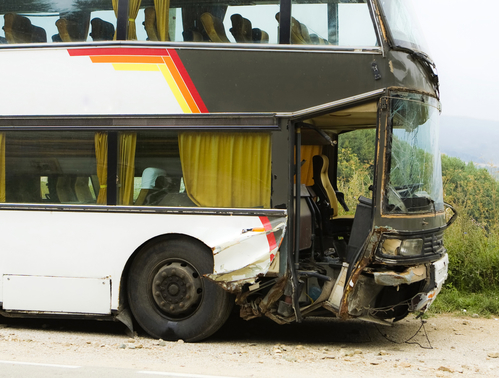 If you’ve been hurt in a bus crash, you need a personal injury lawyer. The NTSB further reported that there were more than 250 people killed and 20,000 injured in bus-related crashes in 2009. From 2000-2007, there were 1,093 fatal accidents involving large buses, resulting in 1,315 fatalities and 3,471 injuries. The Federal Motor Carrier Safety Administration (FMCSA) establishes guidelines for mass transit vehicles. The FMCSA guidelines include the number of hours that a driver can work, the maximum passengers allowed inside a vehicle, and other regulations such as a specialized license. Due to its size and weight, a bus crash can cause serious damage, especially if the bus overturns. Passengers can not only be thrown from their seats, but can also be thrown from the vehicle in a severe accident. If a crash was caused by the negligence of the bus driver or the company that owns the bus, those injured in the collision might be eligible for compensation for their injuries. Costs associated with these injuries can include immediate medical bills as well as future bills for on-going medical care such as rehabilitation and physical therapy. While Insurance companies may offer settlements to victims of an accident, it is important to ensure that any such settlement truly compensates you, the victim, for all of your harms and losses. The attorneys of The Law Office of Mynor E. Rodriguez P.C. have fought tirelessly on behalf of victims injured in bus crashes. We can guide you through the process and put your mind at ease so that you can focus on recovering. Our bus accident lawyer is ready to fight for you and what you deserve. Contact us today.